I think the contents of these two shelves are not so much inventory as they are arsenal. There’s enough hot sauce here to burn the last taste buds off of a vindaloo addict, to break the fifth alarm on the five-alarm-chili machine, to permanently disable the noses of an entire K9 unit. Looking more closely, I think we could probably find the proper hot sauce to fit any recipe in any ethnic cookbook you could buy in New York City, which is where I found this shelf. Indeed, it is right next door to the shocking-variety-of-Spam shelf you might have seen featured here a couple of days ago. Making a quick calculation and figuring that the bottles go back about 3 deep, I estimate there are a minimum of 18 varieties of hot sauce on these two shelves, for a total of approximately 54 bottles. I do believe that such a stock would keep my family happy for at least, say, 3 or 4 generations. That is, if no one accidentally knocked down the shelving in the interim. That might result in the destruction of the world as we know it – which, come to think of it, we might survive. After all, we would have the Spam shelf. And if you survive all that, we’ll see you next time. 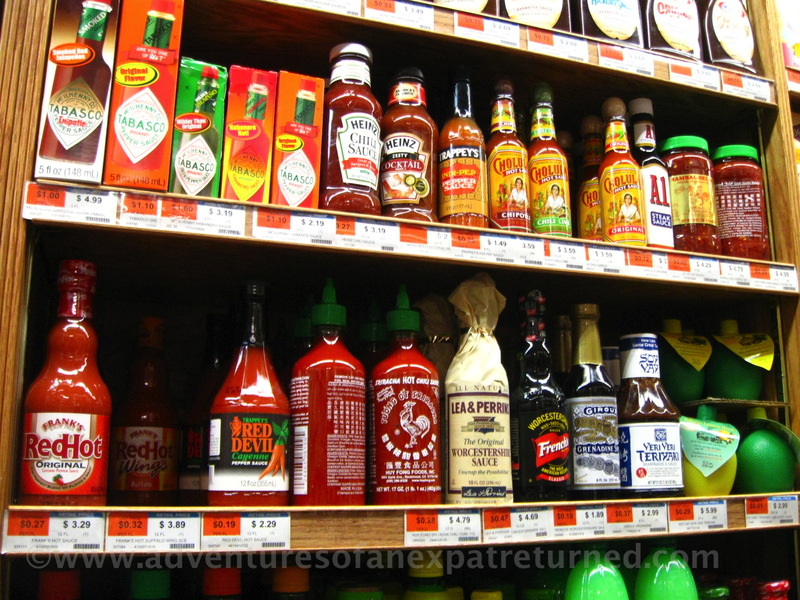 This entry was posted in Glorious Food!, In Jest and tagged Cholula, Food, Hot sauce, New York City, SPAM, Sriracha sauce, Tabasco. Bookmark the permalink. I was down in New Orleans several months ago and they have a store dedicated to all manner of hot sauces. It was incredible getting to sample everything.